A truly gigantic statue in Kiev, next to a museum complex and surrounded by smaller-scale (but still pretty big) socialist realism sculptures. The giant statue is part of a museum complex (it actually stands directly on top of the main part of it), which primarily commemorates WWII, known as "The Great Patriotic War" all over the former USSR. But it now also has exhibits about the current war in eastern Ukraine. In addition there's large open-air part with a collection of tanks, cannons, etc. as well as missiles and a few planes from the Cold War period. More background info: Rodina Mat means "Mother Homeland" (or "Mother Motherland", strangely) and there are several statues of the same name all over the former Eastern Bloc, in particular within the ex-Soviet Union. This one is the tallest overall (including the giant plinth), while the one in Volgograd has the bigger statue as such, which is also more voluminous than Kiev's slender counterpart. Don't get the two confused, which seems to happen a lot. In particular you can often read that the Kiev Rodina Mat is top-heavy or built on unstable foundations and thus threatened with collapse. No! That may have applied to her big sister in Volgograd at some point. But not to this perfectly straight titanium lady. Titanium is the silver metal that she is clad in (though some sources claim it's some other alloy), the same used for many aircraft fuselages. Hence the intense silver. And she is HUGE! The statue alone is 62 metres high (over 200 feet), with its plinth it rises over a hundred metres above ground level (way over 300 feet)! That is tall!! Now add to that her location high above the banks of the Dnieper river – and you'll understand why you can see her from miles away. The total weight of the statue is something like 500 tonnes. She is hollow inside except for a lattice steel structure supporting her outer shell and also containing two elevators, one straight up to shoulder level, one at an angle further up into her left arm which holds the shield (there's a small viewing platform). Apparently the sword she holds in her right hand used to be even longer (16 m) but after independence in 1991, when the majority of the citizens rapidly switched back to being devoutly Orthodox Christians, it was demanded that the sword be shortened, so that its tip was no longer higher than the tip of the cross on top of the golden dome of their holiest site, the Kievo-Pecherska Lavra monastery. This compounds the somewhat blunt look of the sword. Still, she is definitely the most outstanding part of the whole war memorial complex. The smaller sculptures, hardware collections and especially the museum are also worth a look, however. The present museum is the reincarnation of an earlier one. In fact a first exhibition was set up shortly after WWII (and it had already been planned before 1945), and evolved over the years until the decision was made to completely recreate the site and crown it with the Rodina Mat statue., She, and the new museum complex, was finally inaugurated by the USSR's then leader Leonid Brezhnev in 1981. Hence, the Kiev Rodina Mat is sometimes referred to as “Brezhnev's daughter”. More recently, the museum had long been closed for refurbishment again but now it is back open – and I'm happy to report that the revamp has hardly altered the delightfully “retro” Soviet atmosphere inside. What there is to see: The Rodina Mat statue is one of the most impressive sights of the soclialst realism legacy in the East and possibly the most distinctive landmark in Kiev. She is visible from miles away – also helped by her distinctive shiny silver cladding. Her stern face and eyes look determinedly straight ahead, and the whole posture is just as stern. In her right hand she holds up a sword and in the left a shield with a hammer and sickle on it (i.e. the old Soviet emblem – and it's still there!). Impressive as this giant titanium lady is from a distance, to fully grasp her size you have to get up closer. Standing on the square below her feet (and pedestal) really makes you appreciate her colossal size. The light is best in the early morning, by the way, since she is facing north-east. From midday she is therefore backlit by the sun. The golden hour of (summer) sunset light makes her shine golden, but again only from the rear. There is a viewing platform at the top of the pedestal by her feet (actually she doesn't have any feet, her metal gown reaches all the way to the bottom) and apparently you can also go up inside her to reach the small viewing platform at the rear of the shield. I wasn't aware of that when I visited, otherwise I would have been tempted, even though it is said to be quite an adventure. Apparently a lift takes you up most of the way, but to do the final stretch through her left arm to reach the shield you have to climb a very narrow and extremely steep bit with the aid of a rope. But the views are said to be worth the effort (and the extra money). From what I read you have to ask to be allowed in and a guide has to accompany you. But when I was there I saw no indication as to who one would have to ask and where to pay and meet the required guide. If anybody can provide me with the details of all this, I'd be very grateful (contact me). At the foot of the hillside that Rodina Mat stands on are a series of memorial stones specifying the names of all the Soviet “hero cities”. That status was awarded to these places for their special role in WWII and/or for their valiant defenders against the Nazis. This obviously includes Kiev, but also other places not actually occupied or besieged by Germany, such as Murmansk. 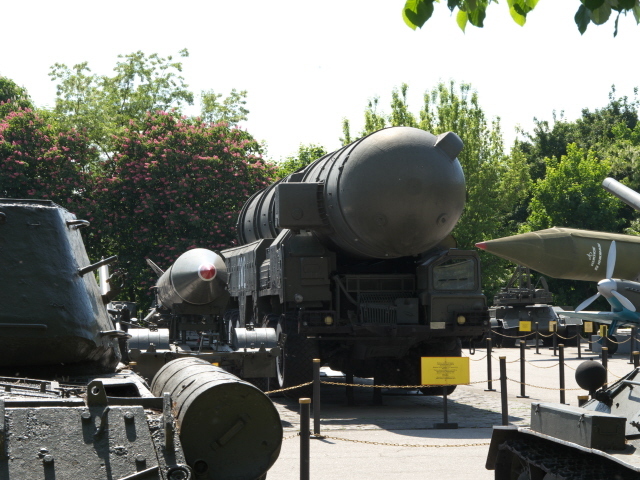 However, the main attraction at this site other than Rodina Mat is the war museum underneath her. Its official cumbersome name is “The National Museum of the History of the Great Patriotic War of 1941-1945”, but I will simply refer to it as WWII museum. As you walk in after having paid your admission you are greeted with a spacious, cavernous hall clad in dark red marble … which in its own way already sets the gloomy tone of the whole museum. It gets really grim at the ensembles of sinister-looking long green overcoats and hoods on sticks that look like a procession of ghost-like soldiers on their way (in heavy rain) to hell. In the centre of the hall is a new row of exhibits pertaining to the current, ongoing war in eastern Ukraine. 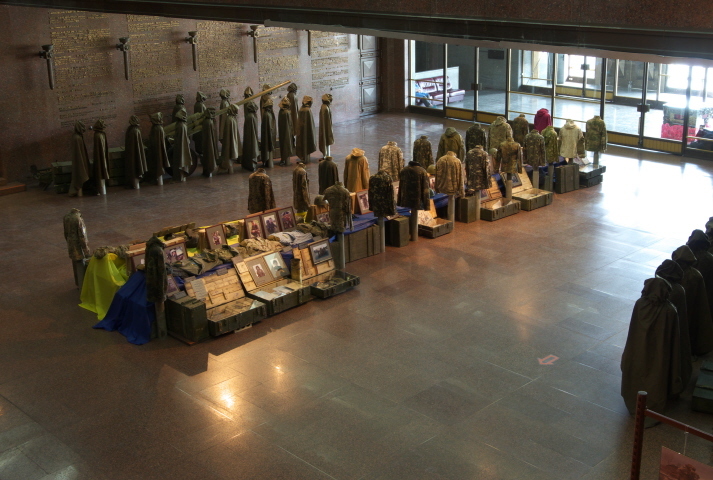 On display are helmets, uniforms, various personal effects of Ukrainian soldiers. This includes a brightly-coloured jacked that belonged to Nadia Savchenko, a military pilot (and member of parliament) who was captured by pro-Russian rebels in eastern Ukraine and transferred to and imprisoned in Russia … where she remains to this day (a year on, at the time of writing, in June 2015). 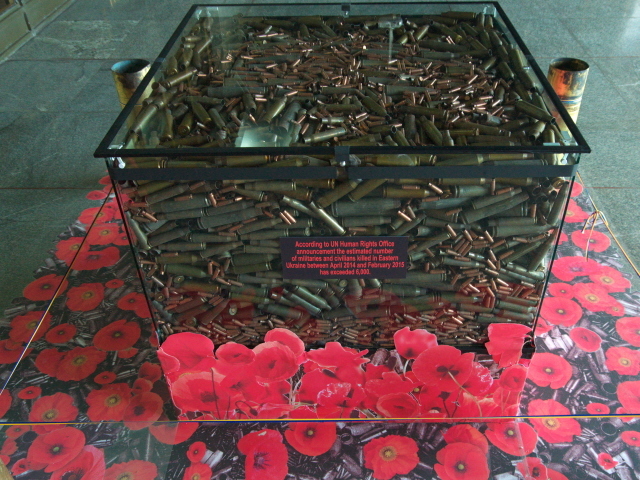 In the foyer of the museum, moreover, is the latest addition to the museum, a large glass box filled with used cartridges of different calibres with a small text plaque on the side stating that according to the UN the number of people killed in the war between April 2014 and February 2015 has reached 6000. The large soldier statue in the centre of the hall is now draped in an oversized Ukrainian flag. But overall, I found the integration of the topic of the current war in this museum not too heavy-handed or too laden with propaganda. There's a palpable dose of patriotism indicated, but no overt anti-Russian sentiments expressed. 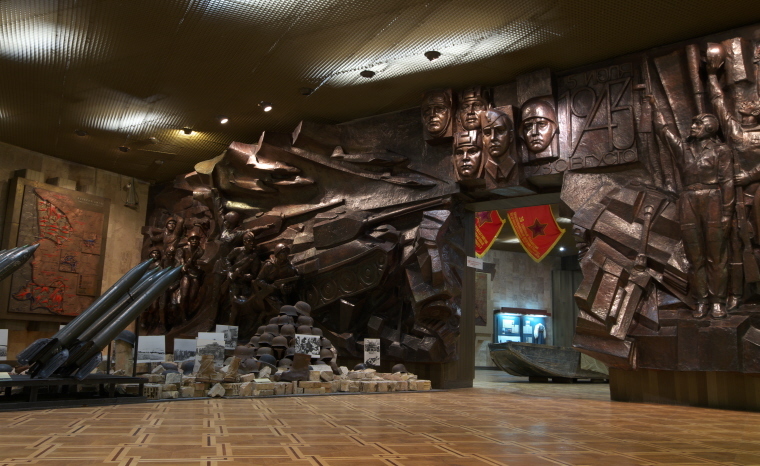 In a niche to the side of the first hall, however, is a section with photo panels showing images of the destruction in the east, the desperation of the (under-equipped) Ukrainian Army and affected civilians. I also found a couple of pretty gruesome, shocking images amongst these (e.g. of burnt corpses). The permanent museum exhibition proper kicks off in more standard, less graphically disturbing fashion, though there is still some sinister stuff in the museum as well. But the main museum's contents are still from the Soviet era and do not seem to have been changed much in the latest refurbishments. Beginning chronologically at first, there's a section about the rise of Nazism in Germany, and then we quickly move on to the invasion of the Soviet Union and the battles of Kiev and other cities (including Odessa and Leningrad). Parts of these sections are more thematically subdivided – one for air warfare, one for the Navy, and so on. Amongst the larger exhibits are a plane wreck, imaginatively doubling up as a scaffold for displaying photos, or replicas of Navy officers' cabins. Obviously there are also various guns, bombs, shrapnel and so on and so forth, as well as rows of glass display cabinets with smaller artefacts and photos and documents. All labels are in Ukrainian only, while the texts/documents include Russian and German originals, but there are no translations into English. However, you can find laminated sheets in English, German and French in some sections that at least provide a summary of the most important bits. You can tell that these translations must be recent additions since, for example, they clearly state how the Soviet Union exploited its part of the Molotov-Ribbentrop Pact to annex the Baltic states and eastern parts of Poland into the USSR before the German invasion. You would hardly have found this stated so bluntly in any old Soviet war exhibition. What remains, on the other hand, are some fantastic examples of socialist realist glorifying depictions of the war in the form of large-scale reliefs and murals. Several of these are truly superb examples of this particular form of Soviet art, ideologically laden as they may be, I found them quite awesome … in that somewhat weird way. In contrast, the section about the Nazi terror against civilians, POWs and in particular Jews, is by far the darkest part of this museum. It occupies two rooms. 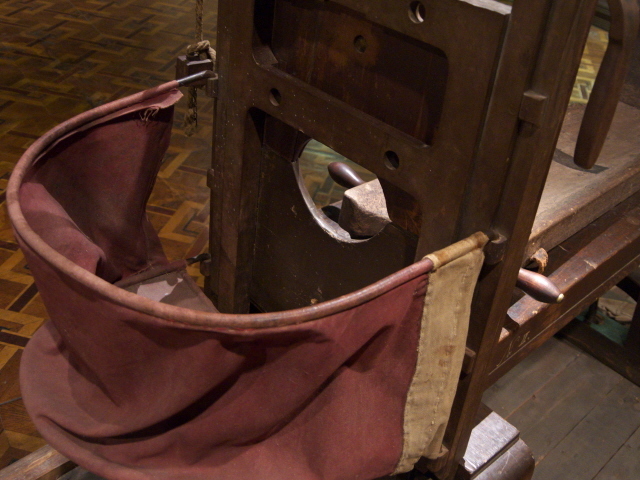 The central exhibit in the first room is a guillotine, complete with the basket to catch the head. It is integrated into a larger arrangement with barbed wire and striped concentration camp clothes. 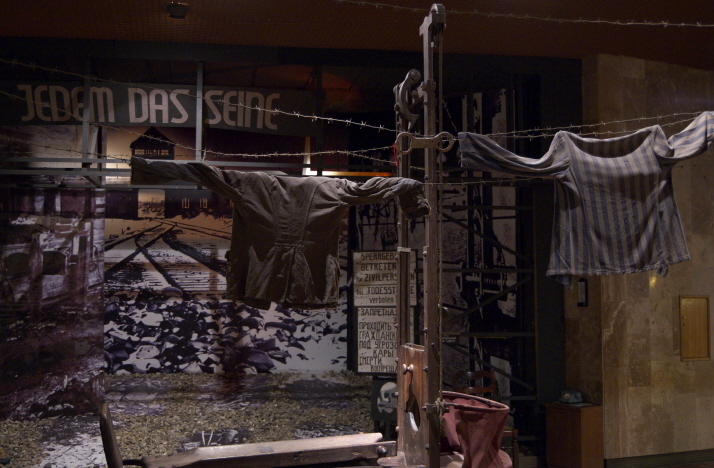 To the right is a large diorama on the topic of concentration camps, involving the slogan “Jedem das Seine” from Buchenwald (rather than the better known “Arbeit macht frei”). 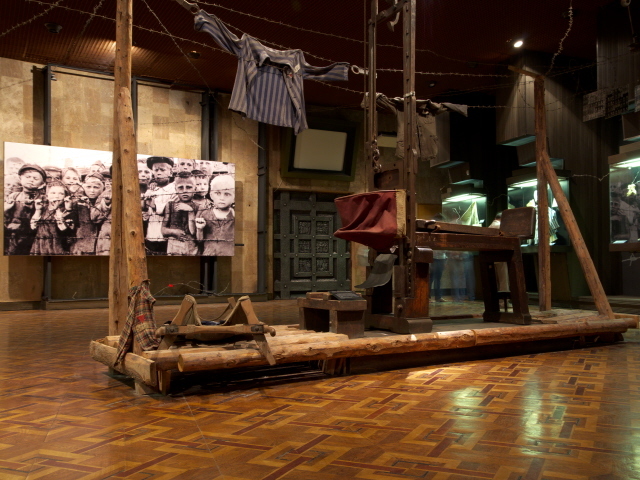 More on the camps and the Holocaust is displayed in several glass display cabinets, including items such as small children's shoes and camp clothes. On the left a gallows throws a sinister shadow onto the wall. The second hall of horrors has as its central exhibit what must count as one of the most gruesome items in any museum on these topics: a bone-grinding machine from Janowska concentration camp near Lviv (then Poland, today western Ukraine). The purpose of the machine was twofold: firstly to destroy evidence of the extermination crimes and b) to make fertilizer out of the pulverized human bones. 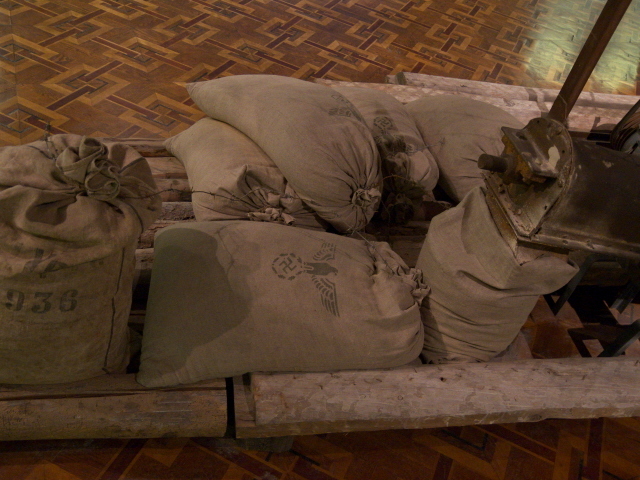 Sacks with Nazi emblems lie next to the machine. It really makes you shudder with disgust. 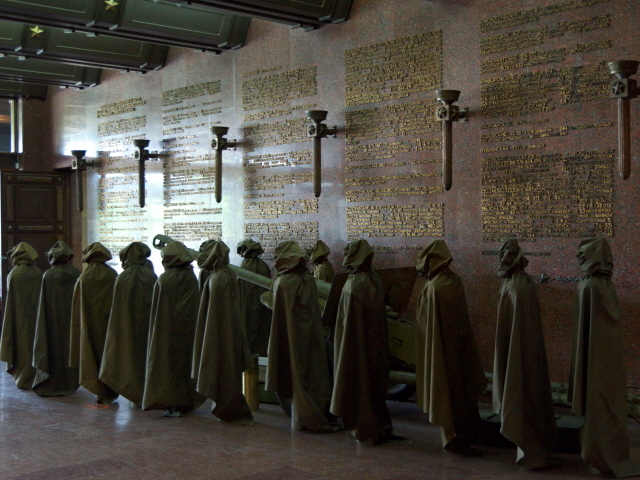 One section of the display cabinets in this room deals with the specific crime of the Babi Yar massacres in which a large part of the Jewish population of Kiev was exterminated in just two days. The next room has displays about the Ukrainian resistance. Here, the main large exhibit is a reconstruction of a partisans' log cabin, presumably some sort of command centre, going by the maps and communication technology inside. The final section in this exhibition is mainly a celebration of the role of the Ukrainian and Soviet economy and industry in the war effort. Steel making and tank building are particularly emphasized. But you can also spot items that are clearly from the Western Allies, such as emergency rations labelled in English. As you come back out into the rear of the main hall, you see a large display of dozens of vinyl record players in front of a large photo collage of people celebrating victory. The four victorious allies of WWII are represented by four girls on whose dresses are superimposed the four respective national flags. You would think that this concluded the museum, but no: there's another section upstairs. Here the celebration continues. If the first half of the exhibition was about the road to war and its worst and most horrifying phases, this second half is all about the road to victory and savouring it big style. Apart from yet more large socialist-realist reliefs and propaganda posters, you find grand dioramas of weapons, some vehicles and guns (yet again), and then some rather spectacular displays of trophies. The most unusual of these is a collection of hundreds of Nazi Wehrmacht “Iron Crosses”, arranged to form the shape of such a cross themselves. Next to it is a slightly singed Nazi flag. Lots of rank emblems ripped from Nazi uniforms are also displayed in glass cabinets. 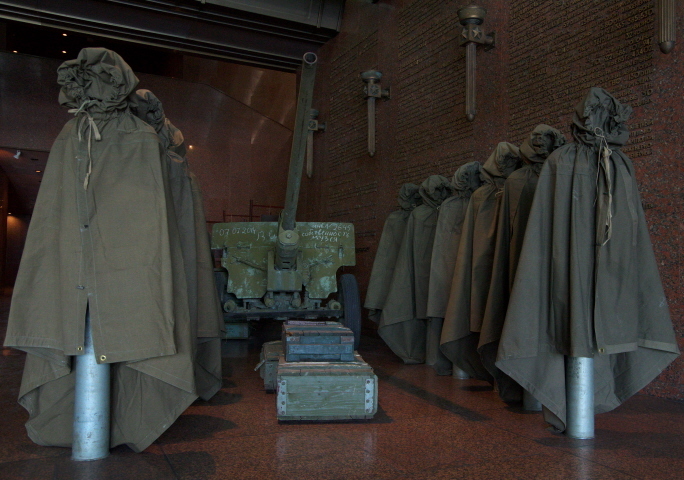 One section is devoted to the final largest prize of the Red Army: the capture of Berlin. 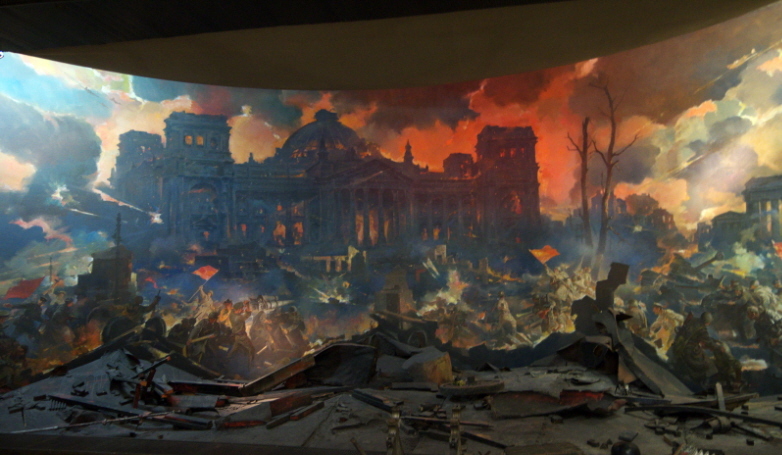 A big mural shows the Reichstag ablaze behind an arrangement of all manner of shrapnel and scorched debris. In one corner the War in the Pacific is also acknowledged, if only as a mere afterthought, it seems. At least there is a small display about the surrender by Japan in August 1945. The rest of the upper part of the museum consists of thousands of period photos along a wall and yet more depictions of the victory celebrations after the War was won. After this you can also proceed one more level up and enter the dome underneath the Rodina Mat statue. It has a Soviet Order of Victory emblem in the centre and a ring of grand mosaics in classic socialist realist style around it. On the columns supporting the dome and Rodina Mat above it, thousands of names are engraved in gold on marble: those awarded the title Hero of the Soviet Union. Back downstairs there is one more room to the side, next to the exit. This seems to be a bit of a mix. Some items still dealt with WWII, others were concerned with later wars, including yet more bits related to the current one in eastern Ukraine. I could not make out any unifying theme here, though. No information other than in Ukrainian was given here. Back outside you can explore more of the outdoor parts of this huge complex. There are yet more exhibitions (outdoor and indoor) as well as further grand socialist realist statuary and reliefs about the war. Though on a smaller scale than Rodina Mat these are nonetheless impressive too. The huge bowl that once had an eternal flame burning in it has long been extinguished (it burned so much gas that it was decided it was an unaffordable waste of resources). But it is still a focal point. So is the big group of statues showing a contingent of soldiers charging forward in battle. Viewed from some angles, however, it looks almost like they are shooting at each other in the chaos. Whatever, the ducks and ducklings on the pond around this scene do not seem to give a toss. 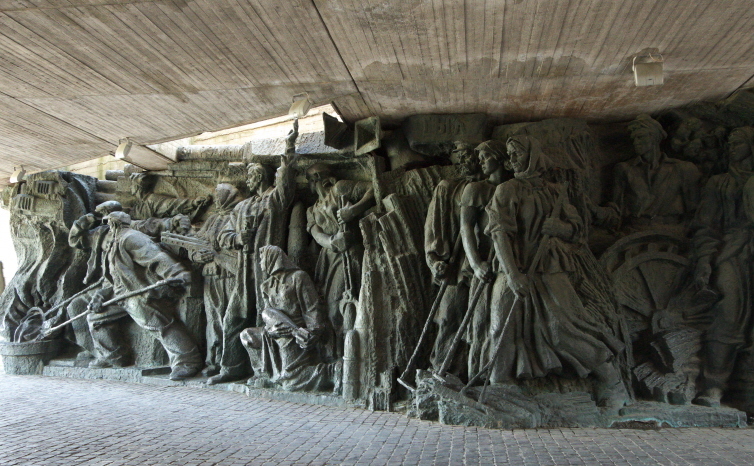 Next to this group of statuary, you can enter a sort of concrete underpass, flanked by yet more large-scale Soviet sculptures of soldiers and workers aiding the war effort. At the front of the concrete complex is a huge stylized Soviet star. All around the memorial complex you find yet more statues as well as various guns, tanks and other military vehicles on display. One larger collection of such big battle gear is in fact an open-air museum in its own right (charging an extra admission fee too). But if you don't want to actually go in you can still get a pretty good impression just by looking in from the fence near the entrance. The majority of the big machines on display are tanks, but what really stands out are the missiles and planes. There is one older, possibly still WWII transport plane, and next to to it two MiG fighter jets. The star pieces, however, must be the large missiles. There's a SCUD missile at the back, now lying on its side (when I was first here in 2006, it was standing upright, as if ready to launch!). And on a trailer is an enormous tube that looks very much like the ones for SS-20s. 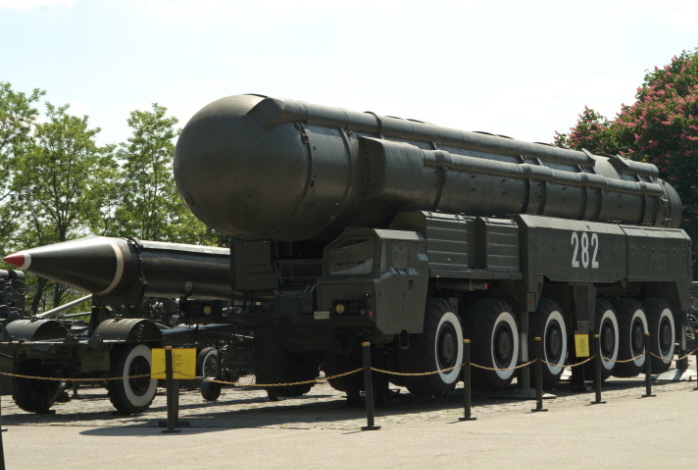 These were the types of intermediate-range nuclear missiles that played such a crucial role in one of the most dangerous phases of the Cold War at the beginning of the 1980s. Right in front of the Rodina Mat are three modern tanks, freely accessible, one of which is brightly painted in Ukrainian colours. It is facing two other tanks in plain military green. I wonder whether there is supposed to be some symbolism in this ... It's certainly changed since my first visit in 2006. Back then there were only two tanks and both were painted in funny colours involving flowers and such like, making them look more like playground installations. This light-hearted approach is no more. But kids still love clambering all over them regardless. Yet more tanks can be seen arranged in a curving row en route to yet another museum to the north of the main one. The indoor exhibition is about foreign wars after WWII, in particular the Soviet war in Afghanistan that in the end was such a disaster. The Soviet presence or assistance in parts of Africa is also covered. I can't report any details because by the time I got there on both occasions I was at the memorial complex, time had run out and it was almost closing time, so no point going in. Next to the museum the open-air exhibits include a Mil Mi-24 attack helicopter, some rocket launchers and modern tanks. Back in 2006, kids were clambering all over them as well. Now the exhibits are cordoned off so you can only look at them. Location: ca. two and a half miles (4 km) south-east of the Maidan in Kiev's city centre, high on the hillside of the western banks of the river Dnieper. Address of the museum: 24, Lavrska St., 01015 Kyiv. Access and costs: a bit off the centre, but quite easy to reach; partly free, otherwise quite cheap. Details: You can get to Rodina Mat and the museums on foot from Kiev's city centre, although it is a bit of a hike – an interesting and in places very beautiful walk, though. Starting from Independence Square (Maidan Nezalezhnosti) walk first towards the river and turn right at European Square. Walk past the great gate to the old Dynamo Kiev football stadium and through the lovely park above it. Then walk round the western side of a modern highrise complex and head further south-east. Carrying on past the futuristic looking Soviet-era Salyut Hotel and across the footbridge over the road, and you get to the Park of Eternal Glory (with its tall needle-like war memorial). Further south through the park you'll eventually get past the famous Pecherska Lavra ('caves monastery' – see combinations below). By now you will already see the shiny silver shape of the Rodina Mat. Follow on in the direction of that beacon and you'll eventually get to the War Museum and its socialist realist surroundings. The nearest metro stations are Arsenalna to the north-west (quite a bit away) or Druzhby Narodiv to the south-west (a long walk along a wide busy street of the same name), but from Arsenalna you can also get a No. 24 bus or No. 38 trolleybus right to the museum and Rodina Mat. Opening hours: the main indoor museum exhibition is open Tuesdays to Sundays 10 a.m. to 5 p.m., closed Monday; the separate "topical expositions" on Afghanistan and other post-WWII conflicts have the same hours but are closed Monday and Tuesday. The open-air part with planes, tanks and missiles is open daily from 9 a.m. to 6 p.m. Admission (2015 prices): main museum – 15 UAH (students 5 UAH), audio guide hire costs 50 UAH. Topical expositions (Afghanistan, “war on foreign soil”, etc. ): 5 UAH (student 2 UAH). At both places an extra fee is charged for a photo permit: 30 UAH, video permit (one hour max): 50 UAH. These extra fees are charged at each place separately, as I understood it. The military vehicles and planes/missiles open-air exhibition: 3 UAH (student 2 UAH), photo permit: 20 UAH, video (1 hour) 40 UAH. Extra fees for entering the aircraft Li-2, Mil Mi-24 and MiG-23: 5 UAH (additional photo/video charges may also apply). The park and outdoor memorial complex is of course freely accessible all the time,as is viewing Rodina Mat from the outside. But to get to the viewing platform at the top, a fee of 200 UAH is charged (including accompaniment by a guide), access to just the platform at the statue's feet/top of the pedestal is 50 UAH. Time required: For the memorial complex and Rodina Mat (viewed from the bottom only) you should allocate about an hour. The main museum requires at least a similar amount of time, potentially more, especially if you can read Ukrainian/Russian. The open-air tanks, planes and missiles exhibition can take up between a few minutes and another hour (depending on your interest in such things) and the other museum about post-WWII conflicts may require another 30-40 minutes. If you walk to the statue/museums from the city centre or from Arsenalna metro station you will pass the Pecherska Lavra, which many regard as Kiev's No. 1 sight … and it contains its own dark element: because of the microclimate inside the dank cave tunnels, many of the monks buried there over the centuries naturally mummified. Across the Dnieper river you can see the sprawling housing estates beyond the eastern banks – in all their old socialist concrete glory of grey uniformity. The sheer size of the sea of apartment blocks is kind of impressive in its own special way.